Almighty ever-living God, who are wonderful in the virtue of all your Saints, grant us joy in the yearly commemoration of Saint Clement, who, as a Martyr and High Priest of your Son, bore out by his witness what he celebrated in mystery and confirmed by example what he preached with his lips. Through our Lord Jesus Christ, your Son, who lives and reigns with you in the unity of the Holy Spirit, one God, for ever and ever. O God, who in Saint Columban wonderfully joined the work of evangelization to zeal for the monastic life, grant, we pray, that through his intercession and example we may strive to seek you above all things and to bring increase to your faithful people. Through our Lord Jesus Christ, your Son, who lives and reigns with you in the unity of the Holy Spirit, one God, for ever and ever. Our God and Father, who conferred upon your servant Blessed Migueal Agustin Pro the grace of ardently seeking your greater glory and the salvation of others, grant, through his intercession and example, that by faithfully and joyfully performing our daily duties and effectively assisting those around us, we may serve you with zeal and ever seek your glory. Through our Lord Jesus Christ, your Son, who lives and reigns with you in the unity of the Holy Spirit, one God, for ever and ever. St. Clement is the third successor of St. Peter who ruled the Church from c. 92 to 102 and is mentioned in the Canon of the Mass. Pope St. Clement wrote a letter to the Corinthians, which is one of the most ancient and precious documents surviving from early Christian times; it shows his profoundly religious spirit, wholly imbued with the mystery of the things of God and love of Christian unity. The most famous of Irish monks, St. Columban was born around 525-530. Well educated and desiring to be a "pilgrim of God," Columban traveled to France and founded several well-disciplined monasteries as centers of religion and culture. Because of difficulties he decided to return to Ireland. A shipwreck directed him towards Rome and to the founding of his final monastery, at Bobbio in Italy. The aged Abbot died on this date in 615. His feast was moved from November 21. It is celebrated on November 23 by Benedictines and Ireland. Fr. Miguel Pro was born in Guadalupe, Mexico, in 1891. The Mexican government began a major persecution of the Church in 1911. Fr. Pro completed his studies in Belgium and was ordained a Jesuit in 1926. He returned to Mexico and performed his ministry heroically until November 23, 1927. He was caught and condemned for being a Catholic priest. Fr. Miguel Pro ended his life facing the firing squad with his arms outstretched until he became a living cross. He called out the words, Viva Cristo Rey! as his body was wracked with a hale of bullets. He was proclaimed "blessed" by Pope John Paul II on September 25, 1988. According to the 1962 Missal of Bl. John XXIII the Extraordinary Form of the Roman Rite, today is the commemoration of St. Felicitas, a Roman martyr of uncertain date. She was buried in the cemetery of Maximus. Her name occurs in the calendar of the Roman Church in the fifth century. St. Clement I of Rome (92-101) was one of the first popes; according to St. Ireneus, he was the third after Peter. Clement most probably died as a martyr. Otherwise little is known of his life. It is not certain whether he is the one Paul mentions as his companion in Phil. 4:3. St. Clement's letter to the Corinthians is authentic; in it he authoritatively intervenes in that strife-torn community, a memorable act in the early history of the papacy. The breviary gives these legendary details. Because of his zeal for souls, Pope Clement was banished to distant Chersonese; there he found two-thousand Christians who had received a similar sentence. When he came to these exiles he comforted them. "They all cried with one voice: Pray for us, blessed Clement, that we may become worthy of the promises of Christ. He replied: Without any merit of my own, the Lord sent me to you to share in your crowns." When they complained because they had to carry the water six miles, he encouraged them, "Let us all pray to the Lord Jesus Christ that He may open to His witnesses a fountain of water." "While blessed Clement was praying, the Lamb of God appeared to him; and at His feet a bubbling fountain of fresh water was flowing." Seeing the miracle, "All the pagans of the neighborhood began to believe." When Trajan heard of these marvels, he ordered Clement to be drowned with an iron anchor about his neck. "While he was making his way to the sea, the people cried with a loud voice: Lord Jesus Christ, save him! But Clement prayed in tears: Father, receive my spirit." At the shore the Christians asked God to give them the body. The sea receded for three miles and there they found the body of the saint in a stone coffin within a small marble chapel; alongside lay the anchor. "You have given a dwelling to Your martyr Clement in the sea, O Lord, a temple of marble built by the hands of angels." 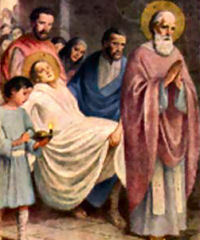 The body was taken to Rome under Nicholas 1 (858-867) by Sts. Cyril and Methodius and placed in a church dedicated to his honor (S. Clemente). This is one of the most venerable of the churches in Rome because it retains all the liturgical arrangements of ancient times. Patron: Boatmen; marble workers; mariners; sailors; sick children; stonecutters; watermen. Symbols: Double or triple cross; tiara; fountain; anchor; maniple; marble temple in the sea; cross and anchor; nimbed lamb. Read this "In Depth Analysis" article on St. Clement of Rome. St. Columban was born in West Leinster, Ireland, sometime between 540 and 550, and decided when he was a youth, to dedicate himself to God despite his mother's opposition. He lived for a time on Cluain Iris, an island in Lough Erne, with a monk named Sinell, and then became a monk at Bangor. With twelve other monks he was sent as a missionary to Gaul about 585. He built his first monastery at Annegray about 590, and it was so successful that he followed with two more, at Luxeuil and Fontes (Fontaines). Soon his followers spread all over Europe, building monasteries in France, Germany, Switzerland, and Italy. He aroused much opposition, especially from the Frankish bishops, by the Celtic usages he installed in his monasteries and for refusing to acknowledge bishops' jurisdiction over them. He defended his practices in letters to the Holy See and refused to attend a Gallican synod at Chalons in 603 when summoned to explain his Celtic usages. In 610 King Theodoric II of Burgundy, angered by Columban's denunciation of his refusal to marriage and his practice of keeping concubines, ordered all Irish monks banished from his realm. Columban was shipwrecked on the way to Ireland but was offered refuge by King Theodebert II of Neustria at Metz and began to evangelize the Alemanni in the area around Bregenz on Lake Constance. Though successful, he was again banished in 612, when Burgundy warred against and conquered Neustria; Theodoric now ruled over the area in which Columban was working. Columban decided to flee his old adversary and crossed the Alps to Italy, where he was welcomed to Milan by Arian King Agilulf of the Lombards. Columban founded a monastery at Bobbio, between Milan and Genoa, which became one of the great monasteries of its time—a center of culture, learning, and spirituality. He died there on November 23. Columban wrote his Monastic Rule, sermons, poetry, and treatises against Arianism. Symbols: Bear's den; wolves; foliated crucifix; fountain; sunbeam. Read more about St. Columban. Miguel Pro was born January 13, 1891, at Guadalupe Zacatecas, Mexico. From his childhood, high spirits and happiness were the most outstanding characteristics of his personality. The loving and devoted son of a mining engineer and a pious and charitable mother, Miguel had a special affinity for the working classes which he retained all his life. At 20, he became a Jesuit novice and shortly thereafter was exiled because of the Mexican revolution. He traveled to the United States, Spain, Nicaragua and Belgium, where he was ordained in 1925. Father Pro suffered greatly from a severe stomach problem and when, after several operations his health did not improve, in 1926 his superiors allowed him to return to Mexico in spite of the religious persecution in the country. The churches were closed and priests were in hiding. Father Pro spent the rest of his life in a secret ministry to the sturdy Mexican Catholics. In addition to fulfilling their spiritual needs, he also carried out the works of mercy by assisting the poor of Mexico City with their temporal needs. He adopted many disguises to carry out his secret ministry. In all that he did, he remained filled with the joy of serving Christ, his King, and obedient to his superiors. Falsely accused in a bombing attempt on the President-elect, Pro became a wanted man. He was betrayed to the police and sentenced to death without the benefit of any legal process. On the day of his death, Father Pro forgave his executioners, prayed, bravely refused the blindfold, and died proclaiming "Viva Cristo Rey!" (Long Live Christ the King). Watch this short Catholic News Agency You Tube video of Fr. Miguel Pro. On July 10 we had the feast of the Seven Martyred Brothers; today their saintly mother receives special honor. Her body, together with that of her youngest son Silvanus, rests in the cemetery of Maximus; later her remains were transferred to the church of St. Susanna, where they still are honored. She was beheaded in 165 A.D.
"That blessed woman Felicity, whose Birth-feast we are keeping today, had as much dread of leaving her seven sons living after her in the flesh, as have carnal minded mothers of seeing them go dead before them. When she was taken in the strong pains of persecution, she braced up the hearts of her children by bidding them cleave to the Fatherland above, and became their mother for the spiritual, as she had previously been for the fleshly life, bringing them forth for God by her exhortation, as she had brought them forth for the world by her body. And shall I not call this woman a Martyr? Nay, more than Martyr. The seven whom she trusted to God were seven children sent before her to death. She suffered first and triumphed last." Patron: Death of children; martyrs; sterility; to have male children; widows. Symbols: Seven swords; cauldron of oil and sword; sword with seven heads; eight palms.